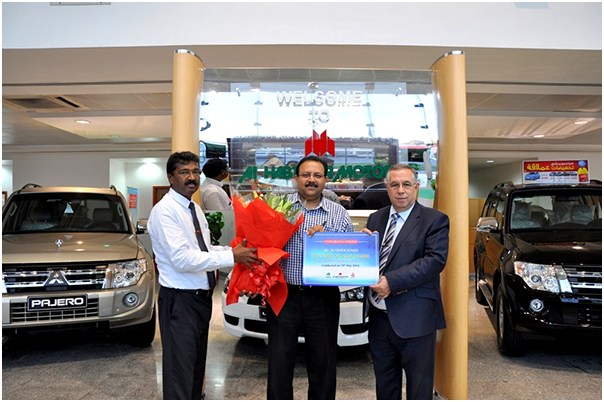 Al Habtoor Motors announces the winner of the Routine Maintenance Contracts promotion WINNER WINS AED 40,000 CASH REWARD! Al Habtoor Motors continues to enthrall its customers with a superior motoring experience and unbeatable value with its after sales service. In keeping with its commitment, Al Habtoor Motors recently held a special 8-Service Contract promotion for its Mitsubishi ASX, Lancer, Lancer Fortis, Lancer EX, Pajero, Pajero Sport and L200 customers from 8th March – 7th May 2014. The 2-month long 8-Service Contract promotion included intermediate, standard and major Services, along with a chance to win a vacation to a fabulous destination of the customer’s choice, or AED 40,000 in cash. After the much anticipated final draw Mr. Sudher Jones was declared the winner of AED 40,000. “I still cannot believe that I have won. I saw the promotion as a great savings since I would be assured of timely quality service for my vehicle without much financial strain. Now the savings aspect has proved to be more than what I had even imagined. I thank Al Habtoor Motors for their excellent service and for organizing such value-added promotions”, commented Mr. Sudher Jones. Priced at AED 4,440 for the Lancer, AED 4,500 for the Lancer Fortis and EX, AED 4600 for the ASX, AED 4,999 – AED 5100 for the various Pajero models, AED 5,050 for the Pajero Sport and AED 4,700 to AED 6,700 for the different L200 models, the 8 Service Contract encourages customers to undertake automotive care for their Mitsubishi vehicles with Genuine Service thus avoiding the risk of non guaranteed service and repair by unauthorized service centers. “Service contracts always offer customers total peace of mind and additional benefits such as easy warranty claims if and when needed and better resale value for the vehicle by providing the service history. The contract also ensures manufacturer recommended services are carried out by Mitsubishi authorized personnel. This in turn protects the investment of the customer.” added Mr. Anan Nimer, Aftersales Director for Al Habtoor Motors.